Fast and convenient wireless charging for your Google Pixel 3 and Pixel 3 XL has arrived. 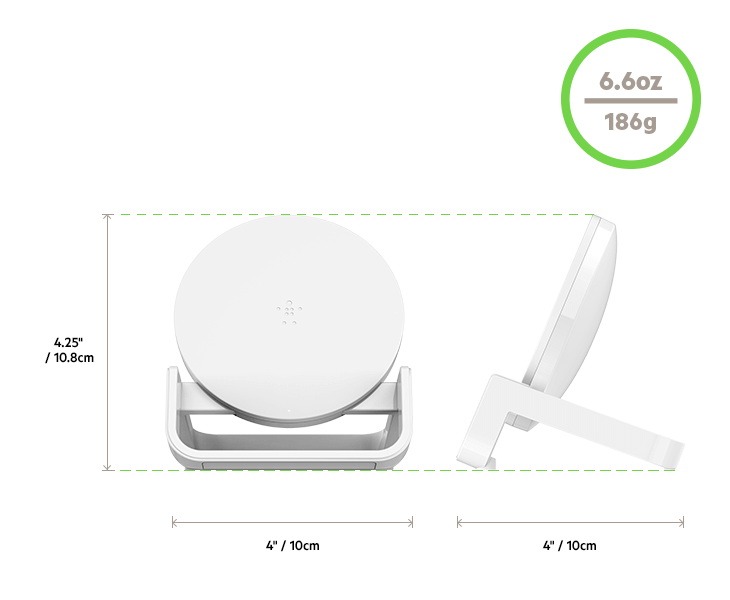 The BOOST↑UP Wireless Charging Stand 10W uses Google’s proprietary 10-watt charging technology to deliver fast and optimal wireless charging. A wireless charger with smart technology is the perfect companion for your new Pixel. **Use of Google’s “made for” badge means that this product has been designed by Belkin for use with the Google Pixel 3 and Pixel 3 XL and has been certified by Belkin to meet Google’s compatibility standards. Google is not responsible for the operation of this product or its compliance with any applicable safety or other requirements. Charge your Pixel 3 or Pixel 3 XL in just two hours. † Equipped with Google’s proprietary 10W wireless charging technology for faster charging than 5W standard wireless chargers. Maximum wireless charging speed is based on the maximum allowed by your device. Maximum wireless charging speed is based on ambient temperatures and/or the maximum allowed by your device. An original, thoughtful design makes it easy to align your Pixel 3 or Pixel 3 XL for fast wireless charging in either landscape or portrait mode. From browsing a web page to watching a movie, it’s easy to continue using your phone while you charge. Specifically engineered to optimize performance for the Google Pixel 3 and Pixel 3 XL, the BOOST↑UP Wireless Charging Stand 10W not only charges at the fastest possible wireless charging speed but protects phone functionality while charging. Premium shielding and precision resistors found within this wireless charger minimize interference, ensuring battery life and critical phone functions such as network signal, touchscreen, WiFi, Bluetooth and LTE are not disrupted. When your phone is correctly aligned on the stand and charging, a white LED light appears. The light has been designed to not disrupt your environment. A metal object on your wireless charging mount can cause the charger to emit unnecessary power, melting the object. To protect your Pixel 3 or Pixel 3 XL and charger from accidental damage, the BOOST ↑UP Wireless Charging Stand 10W features an LED light that signals if something dangerous is between your phone and wireless charger. Charge without removing your case. The BOOSTUP Wireless Charging Stand 10W is engineered to work with lightweight plastic cases up to 3mm (not compatible with metal cases). Google, Google’s “made for” badge, G logo, and related marks and logos are trademarks of Google LLC.